Memorandum Dec 1865 Mond. 18 Snowed little Gilbert went to Butler Centre to see about lots 5 & 7 B6 &c Sold old sheep to Pat Grade $5.00 C. Churchill worked sidding &c Eugene drew 1 ld of sand attended singing school. Judd D. Hornbeck and I lathed after singing school Gave Sherwood Jim Clark's $200.00 $15.00 to send to Pierce. Tues. 19 Judd Hornbeck here all night & worked till 9 p.m. today. Jim Hornbeck & Ovid Hare plastered stove, quite cold. 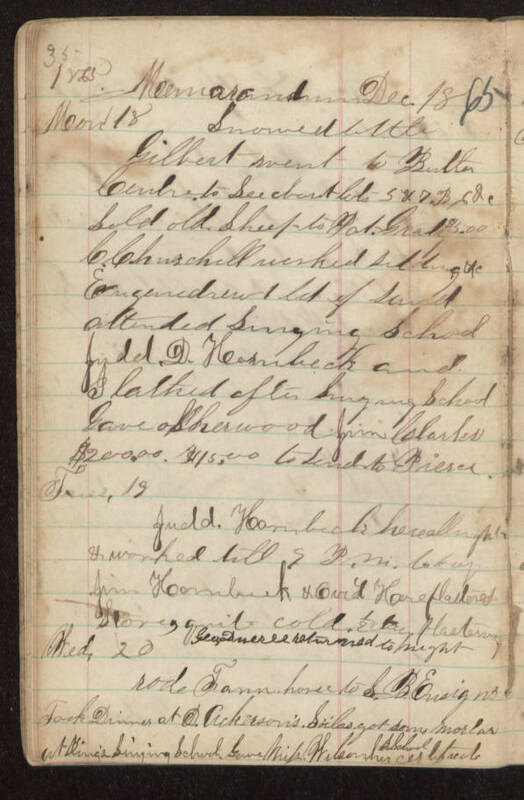 1/2 day plastering (illegible) returned tonight Wed. 20 Rode Fann horse horse to S. B. Ensign's Took dinner at D Ackerson's. Silas got some mortar at [King's?] Singing School. Gave Miss Wilson her school certificate.